Question 2:Your army is blamed for its excessive use of force during this war. Why are civilians shelled? H.E. President Bashar Al-Assad: When a terrorist attacks you with weapons, how do you defend yourself and your people, with dialogue?! The army uses weapons when the other side uses them. For us in Syria, it is impossible to have our objective as shelling civilians. There’s no reason to shell civilians. If we are killing civilians, in other words killing our people, fighting terrorists at the same time, and fighting the states which stand against us and which support terrorists, like the Gulf countries, Turkey, and the West, how could we stand for four years? If we haven’t been defending the people, we wouldn’t have been able to stand all this pressure. Consequently, saying that we are shelling civilians doesn’t make any sense. Question 3:Satellite imagery of the cities of Homs and Hama show completely destroyed neighborhoods; and the United Nations, of which your country is a member, talks about 190,000 people having been killed in this war. Were all the people in those neighborhoods terrorists? H.E. President Bashar Al-Assad:First of all, you need to verify the figures provided by the United Nations. What are the sources of these figures? The figures being circulated in the world, particularly in the media, are exaggerated and inaccurate. Second, images of destruction are not only obtained through satellite images, they are there actually on the ground, and they are accurate. When terrorists enter a certain region and occupy it, the army has to liberate it, and there is a battle. So, naturally, there is destruction. But in most cases, when terrorists enter a certain area, civilians flee from it. In fact, the largest number of victims in Syria is among the supporters of the state, not the other way round; and a large number of those were killed in terrorist attacks. Of course, when you have war and terrorism innocent people die. This happens everywhere in the world. But it is impossible for a state to target civilians. Question 4:According to the United Nations too, there are three million Syrian refugees in neighboring countries, what amounts to one eighth of Syria’s population. Are all those allied with terrorists? H.E. President Bashar Al-Assad: No, no. Those who left Syria are generally people who left because of terrorism. There are those who support terrorism, and there are those who support the state but left because of the security situation. There is also a significant number of those who do not support any side. Question 5:From a military perspective, do you have the means which enable you to win this war? H.E. President Bashar Al-Assad: Now we are fighting states, not only gangs. Billions of dollars are spent on those gangs. They receive arms from different countries, including Turkey. So, it is not an easy war from a military perspective. Nevertheless, the Syrian Army is winning in many places. On the other hand, no one can say how this war will end or when. But the major war for them in the beginning was how to win the hearts of the Syrians; and they have lost this war. The communities which embraced terrorists have become very small, and that is the reason why the army is winning. So, we have to look at this war militarily, socially, and politically. Question 6:But they haven’t lost yet, since half your territories are out of your control. H.E. President Bashar Al-Assad: The Syrian Army doesn’t have a presence everywhere, and it’s impossible for it to be everywhere. Consequently, in any place that the Syrian Army doesn’t have a presence, terrorists cross the borders and enter that region. But the Syrian Army has been able to regain control over any region it decided to enter. This is not a war between two armies where you can say that they took a certain part and we took another part. The war now is not like that. We are talking about terrorist groups which suddenly infiltrate a city or a village. That’s why it’s going to be a long and difficult war. Question 7:Many people say that the solution lies in your departure. Do you believe that your departure is the solution? H.E. President Bashar Al-Assad: The president of any state in the world takes office through constitutional measures and leaves office through constitutional measures as well. No President can be installed or deposed through chaos. The tangible evidence for this is the outcome of the French policy when they attacked Gaddafi. What was the result? Chaos ensued after Gaddafi’s departure. So, was his departure the solution? Have things improved, and has Libya become a democracy? The state is like a ship; and when there is a storm, the captain doesn’t run away and leave his ship to sink. If passengers on that ship decided to leave, the captain should be the last one to leave, not the first. Question 8:This means that the captain is prepared to die. You talked about Gaddafi. Do you fear facing the same fate and to meet your death like Saddam Hussein and Gaddafi? H.E. 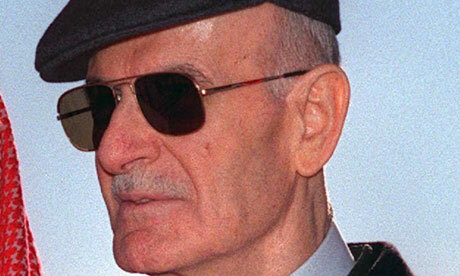 President Bashar Al-Assad: A captain doesn’t think of life and death, he thinks of saving his ship. If the ship sinks, everybody will die, so we would rather save the country. But I want to stress an important point here. Remaining president had never been my objective, before, during, or after the crisis. But we as Syrians will never accept that Syria become a western puppet state. This is one of our most important objectives and principles. Question 9:Let’s talk about ISIS. Some people say that the Syrian regime encouraged the rise of Islamic extremists in order to divide the opposition. How do you respond to that? H.E. President Bashar Al-Assad: In Syria we have a state, not a regime. Let’s agree on the terms first. Second, assuming that what you are saying is true, that we supported ISIS, this means that we have asked this organization to attack us, attack military airports, kill hundreds of soldiers, and occupy cities and villages. Where is the logic in that? What do we gain from it? Dividing and weakening the opposition, as you are saying? We do not need to undermine those elements of the opposition. The West itself is saying that it was a fake opposition. This is what Obama himself said. So, this supposition is wrong, but what is the truth? The truth is that ISIS was created in Iraq in 2006. It was the United States which occupied Iraq, not Syria. Abu Bakr al-Baghdadi was in American prisons, not in Syrian prisons. So, who created ISIS, Syria or the United States? Question 10:The Syrians we meet in Damascus talk about sleeping Jihadi cells in the West more than they talk about the war against ISIS. Isn’t that strange? H.E. President Bashar Al-Assad: Terrorism is an ideology, not an organization or a structure; and ideology doesn’t acknowledge any borders. 20 years ago, terrorism used to be exported from our region, particularly from Gulf countries, like Saudi Arabia. Now, it is coming to our region from Europe, especially from France. The largest percentage of the European terrorists coming to Syria are French; and you had a number of incidents in France. There was also an attack in Belgium against a Jewish museum. So, terrorism in Europe is no longer asleep, it is being awakened. Question 11:The Americans, in their war against ISIS, are tactical (temporary) allies. Do you still think that their intervention constitutes a violation of national sovereignty? H.E. President Bashar Al-Assad: First, you said that it is tactical, and this is an important point. You know that tactics without a strategy do not produce results, so it will not defeat terrorism. It is an illegal intervention, first because it is not authorized by a Security Council resolution, and second because it did not respect the sovereignty of a state, Syria, in this case. So, it is an illegal intervention, and consequently constitutes a violation of sovereignty. Question 12:According to Agence France Presse, your air forces made at least 2,000 sorties in 40 days, and this is a huge number. When your aircraft cross the alliance’s aircraft, for instance on their way to shell Raqqa, do you coordinate or do you have a non-aggression agreement? H.E. President Bashar Al-Assad: There is no direct coordination. We attack terrorism everywhere, regardless of what the United States, or the alliance it leads, is doing. You might find it strange that the number of daily Syrian air strikes against terrorists is larger than that launched by the alliance. There’s no coordination; and at the same time you need to realize that the alliance’s airstrikes are merely cosmetic. H.E. President Bashar Al-Assad: Don’t you see that this question contradicts the earlier question, in which you said that we support ISIS? This means that we are ISIS’s enemies. Journalist:I said that some people say, sometimes, that you have supported ISIS to divide the opposition. H.E. President Bashar Al-Assad:And I didn’t mean “you” by my remark, I meant “those” people. Journalist:Since one result of the alliance’s airstrikes, from an American perspective, was Chuck Hagel’s resignation, do you think that the alliance’s airstrikes are helping you? H.E. President Bashar Al-Assad:Terrorism cannot be destroyed from the air, and you cannot achieve results on the ground without land forces who know the geographical details of the regions and move in tandem with the airstrikes. That’s why, and after two months of the alliance’s airstrikes, there are no tangible results on the ground in that direction. And that’s why saying that the alliance’s airstrikes are helping us is not true. Had these airstrikes been serious and effective, I would have said that they would be certainly useful to us. But we are the ones fighting the battles against ISIS on the ground, and we haven’t felt any change, particularly that Turkey is still extending direct support to ISIS in those regions. Question 14:On July 14th, 2008, you stood on the presidential podium in the Champs Elysees on the sidelines of the Mediterranean summit. Today, the French government considers you an outcast. How do you feel about that? H.E. President Bashar Al-Assad: The good relationship which extended from 2008 to 2011 was not based on a French initiative. 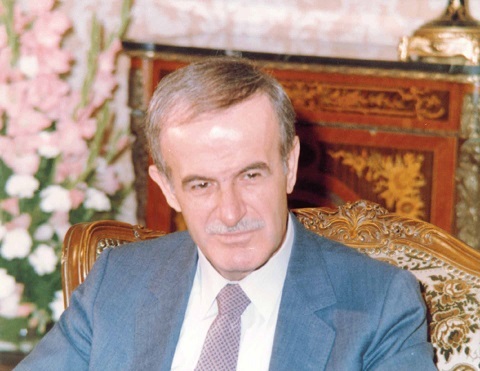 It had two sides: the first was an American effort to make the French government influence the Syrian role, particularly in relation to Iran. The second side was a result of Qatar urging France to improve relations with Syria. So, the good relations with France had American and Qatari motives and were not the product of an independent will. Today, there is no difference since both administrations, I mean those of Sarkozy and Hollande, are not independent. Question 15:Francois Hollande still considers you an opponent. Do you believe that you can revive relations with him some time in the future? H.E. President Bashar Al-Assad: The issue has nothing to do with personal relations, for I don’t know him to start with. It has to do with relations between states and institutions, relations based on the interests of two nations. When there is any French official, or French government, seeking mutual interests, we will deal with them. But this administration is acting equally against the interests of our people and against the interests of the French people. As for him considering me a personal enemy, I don’t see the logic of that. I’m not competing with Hollande for anything. I believe that Hollande’s competitor in France now is ISIS, because his popularity is close to that of ISIS. H.E. President Bashar Al-Assad: No. When we announced this, it was a clear announcement, and when we decided to abandon chemical weapons, our decision was final. Question 17:But U.S. Secretary of State John Kerry accuses you of violating the agreement because you used chlorine. Is that true? H.E. President Bashar Al-Assad: You can find chlorine in any house in Syria. Everyone has chlorine, and any group can use it. But we haven’t used it because we have traditional weapons which are more effective than chlorine, and we do not need to use it. We are fighting terrorists, and using traditional weapons without concealing that or being shy about it. So, we don’t need chlorine. These accusations do not surprise us; for when did the Americans say anything true about the crisis in Syria? Question 18:Have you used chemical weapons? H.E. President Bashar Al-Assad: We haven’t used this kind of weapons; and had we used it anywhere, tens, if not hundreds, of thousands of people would have died. It’s impossible for these weapons to kill, as it was claimed last year, only one hundred people or two hundred people, particularly in areas where hundreds of thousands, and maybe millions, of Syrians live. Question 19:In your latest visit to Paris in November 2010, I conducted an interview with your wife, Mrs. Asmaa al-Assad. Do you miss traveling outside the borders of your country? H.E. 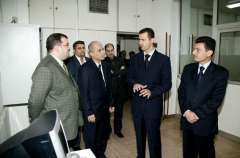 President Bashar Al-Assad: Traveling is not one of my hobbies anyway; and my visits were not for tourism, but for work. What I truly miss is Syria as it was. This is what we miss. And of course we miss the existence of a different world, a world which has logical and moral relations. At that time, we used to have great expectations for the development of our region, for more intellectual openness. We used to believe that France, with its cultural heritage, is the country which is most capable of playing this role with Syria in the Middle East. Question 20:Your wife used to consider herself an ambassador of modernity. How does she live in Syria, and how does she feel about what is happening in Syria, particularly that she hasn’t left the country? H.E. President Bashar Al-Assad: Like all Syrians, she feels pain. Both of us feel pain for the destruction and the blood we see in Syria, to see Syria going backwards decades and not years. It’s painful to see the country which used to be one of the top five countries in the world in terms of security become a safe haven for terrorists. It is also painful for both my wife and I to see our belief that the West will help us in our bid for development and openness go in the opposite direction, and what is even worse, to see the West having allies among these medieval states in the Gulf, like Saudi Arabia and Qatar. Question 21:People describe you as being very close to your children. How do you explain to them what is happening to your country when you return home in the evening? H.E. President Bashar Al-Assad: Of course, this discussion goes on in every Syrian house now; and the most difficult thing in this discussion is when you deal with children whose social consciousness has developed during this crisis. There are two basic questions asked, not only in our family but in many families. The first question: how can people who believe or say they are defending God and Islam kill and murder? This is a case which is not easy to explain, and children ask whether these people know that they are wrong. And the answer here is that there are those who know but make use of religion for private purposes, and there are ignorant people who do not know that religion is good. They think, instead, that religion means killing. H.E. 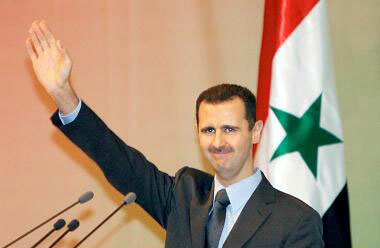 President Bashar Al-Assad: Thank you.